If you are looking for a high fibre breakfast cereal that is packed full of protein, vitamins and minerals, but that is also tasty, look no further than Kashi GoLean Cinnamon Crumble. With twice the fibre and protein than the average breakfast cereal, this is the perfect cereal to start the day on. Furthermore, it is also really tasty, with the sweet cinnamon flavour the perfect thing to wake up your taste buds in the morning. It also has a delightful crumbly texture, which makes it doubly delicious, so it's no wonder it has become one of America’s favourite breakfast items. 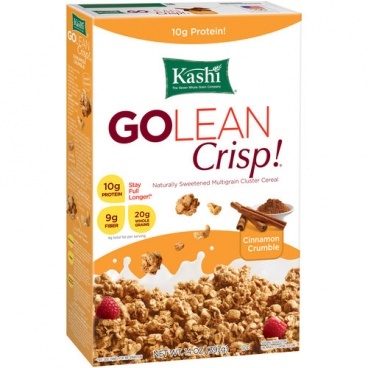 With 397grams, this box of Kashi GoLean Cinnamon Crumble contains plenty of bowlfuls of this delicious cereal. Because it is so high in fibre and protein, few other breakfast cereals will give you a better start to the day. Furthermore, you will feel fuller, for longer, so are less likely to resort to snacking during the morning. Great for kids, great for adults, Kashi GoLean Cinnamon Crumble is one of the tastiest and most nutritious breakfast cereals around. Whole Grain Oats, Evaporated Cane Juice Crystals, Soy Protein Concentrate, Wheat Sticks (Whole Wheat Flour, Kashi Seven Whole Grains And Sesame Flour [Whole: Oats, Hard Red Wheat, Rye, Brown Rice, Triticale, Barley, Buckwheat, Sesame Seeds], Calcium Carbonate), Brown Rice Syrup, Chicory Root Fiber, Soy Grits, Expeller Pressed Canola Oil, Yellow Corn Flour, Soy Protein Isolate, Cinnamon, Oat Fiber, Baking Soda, Natural Flavor, Evaporated Salt, Mixed Tocopherols For Freshness, Soy Lecithin. Contains Soy And Wheat Ingredients.